This video is part of the appearance, “Docker Presents at Tech Field Day Extra at DockerCon17“. 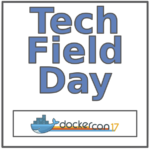 It was recorded as part of Tech Field Day Extra at DockerCon17 at 15:00-16:00 on April 17, 2017. Banjot Chanana, Senior Director Product Management at Docker, reviews how Docker is working to close the trust gap with enterprises who want to run Docker in a production environment. To that effect, they’ve built Docker Enterprise Edition, which includes robust support, quarterly releases, and certified infrastructure, plugins, and containers.